Pink Gazelle Productions: Authentic Lives…Authentic Works » Je Voyage à Paris! 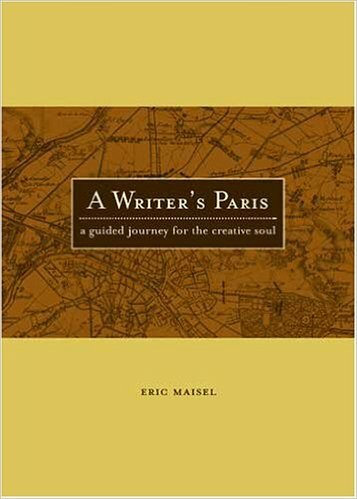 “Paris improves your writing because it teaches you something profound about intimacy,” writes Eric Maisel in his beautiful book, A Writer’s Paris; A Guided Journey for the Creative Soul. SIGN ME UP! I said to the Universe, after reading Eric Maisel’s exquisite and inspiring book. And wouldn’t you know it but apparently the Universe was listening because shortly after reading A Writer’s Paris, the opportunity to actually write in Paris presented itself to me on a silver platter…by the same friend, Trisha, who GAVE me A Writer’s Paris in the first place! Six months ago, Trisha sent me the book after reading it herself in Paris – because she knew it would be right up my alley. Her boyfriend lives in Paris, which is why she’d been there. And wouldn’t you know it, but said boyfriend would, of course, be coming back to Canada at some point to visit Trisha…and when that time came, perhaps I might be interested in staying in his apartment? After I picked myself up off the floor, I said…YES!!! Which was quickly followed by a huge THANK YOU! And so, that’s how it came to pass that yours truly will soon be departing for Paris to write and explore and eat as many chocolate croissants as is humanly possible in two weeks. But what if I go to Paris and not write? Will I be disappointed in myself? Interestingly, several friends have expressed concern about my intention to do some writing while I am in Paris…wouldn’t I rather just wait and see how I feel when I get there? Hah! If I waited until I FELT like writing, I would never get much writing done. For many years now, my approach at home has been to make a commitment to write for at least ninety minutes, first thing on weekday mornings. Writing has become as important – and routine – to me as breathing. I don’t care how I feel when I turn on the computer…because I know I will feel far WORSE if I don’t write. The project I’ll be working on in Paris is a screenplay and although I don’t expect to come home with a finished first draft, a decent start will suffice. As long as I put in a total of 15 hours of writing over the two weeks, I’ll be happy…regardless of what I create. Hope you really enjoy. Look forward to hearing all your tales! I’m beyond excited for you! This adventure sounds like a perfect getaway to write and relax!! What thoughtful, generous friends. Wishing you a time of words flowing from your pen! Have a great trip. Bon voyage!!! We’ll have to have a chat before you leave (I believe that is on August 29th?) — I love this post you wrote — and I have faith in your disciplined approach to writing — and just know the results will be exciting. Such a great adventure for you! Can’t wait to hear all about it. Hope you’ve had a fab summer, Sarah!